Cowabunga! Cult game author Kevin Wilson has taken on the pizza-hungry heroes and developed a sewer crawler. And it meets the expectations of comic book fans and board gamers equally. 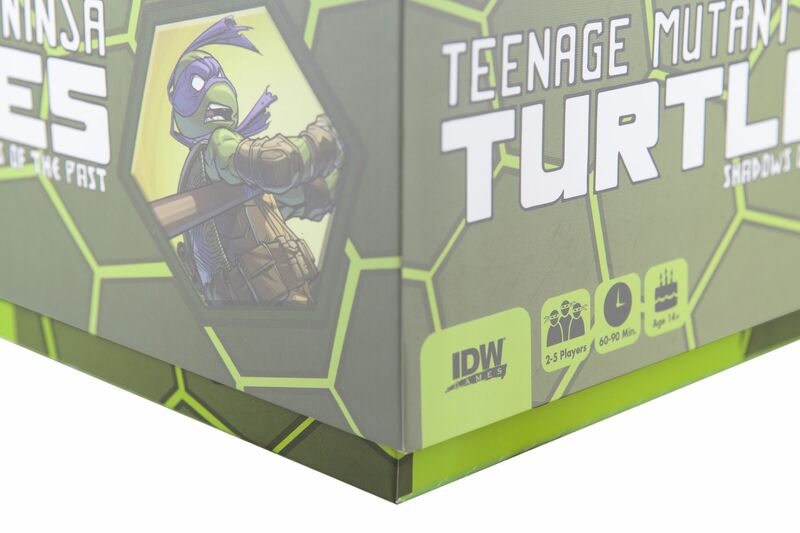 Up to five players either slip into the shell of their favorite hero or make life difficult for the Turtles as a villain. The gamer's life, however, becomes a lot easier with our foam tray set. The lower tray with 23 custom-made compartments keeps your box clear and tidy. Donatello, Leonardo, Michelangelo and Raphael, along with the supervillains and their footmen, find a safe place in 13 circular compartments. Donatello gets a little more space, so that his Bo fits into it. All other figures are also placed in such a way that weapons and other details do not bend. 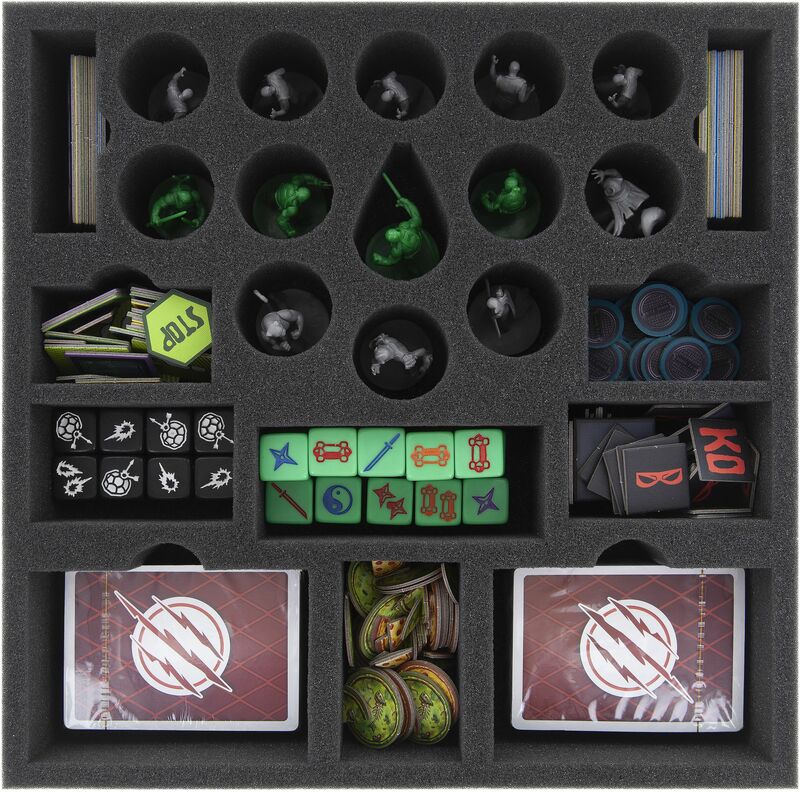 In addition, there are two large compartments for the game cards. Of course, these also fit in sleeved. Battle and Action dice are each given their own compartment. The remaining compartments for the tokens are also designed for quick and easy arrangement. This prevents a nerve-wracking confusion of the game materials and you will always keep the overview. 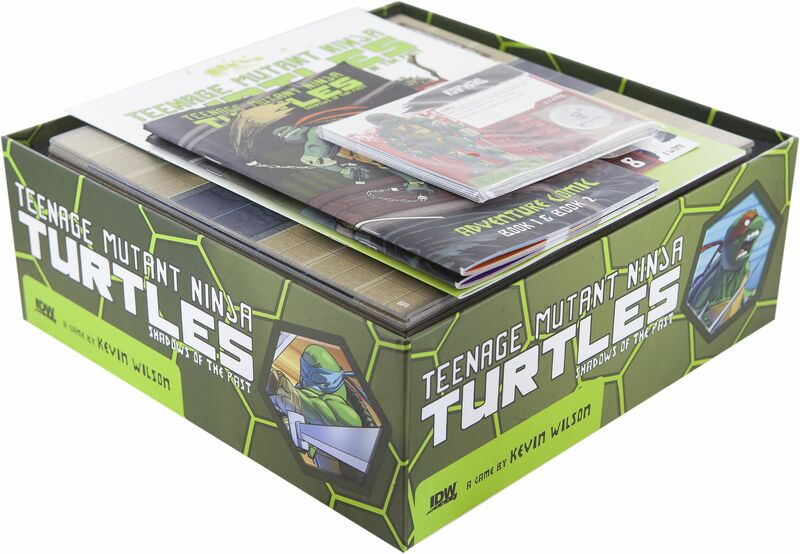 34 compartments of the upper tray will protect the miniatures of Shredder's Foot Clan and the Street Thugs. 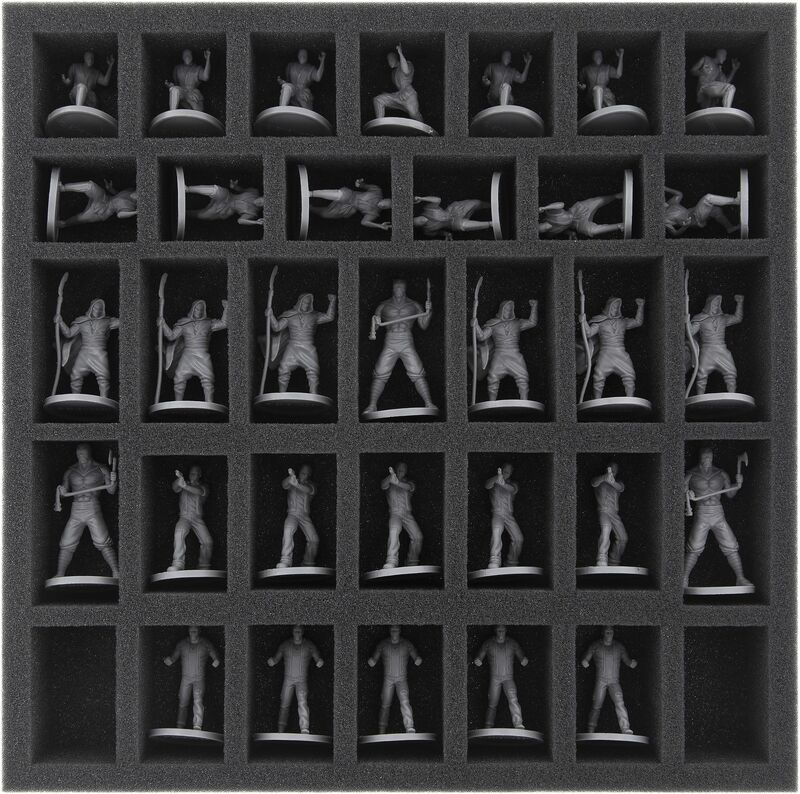 All figures can be clearly arranged in correspondingly large compartments. Completely surrounded by foam, sensitive details, such as weapons or hands, remain intact even during the bumpiest transport. Painted figures keep their colors. The Map, Hero and Villain sheets, as well as the Rulebook and Adventure comics can be placed on the foam cover. Therefore everything is safely stowed away and the life expectancy of your game increases significantly. The lid of the board game box protrudes about 1-2 cm. 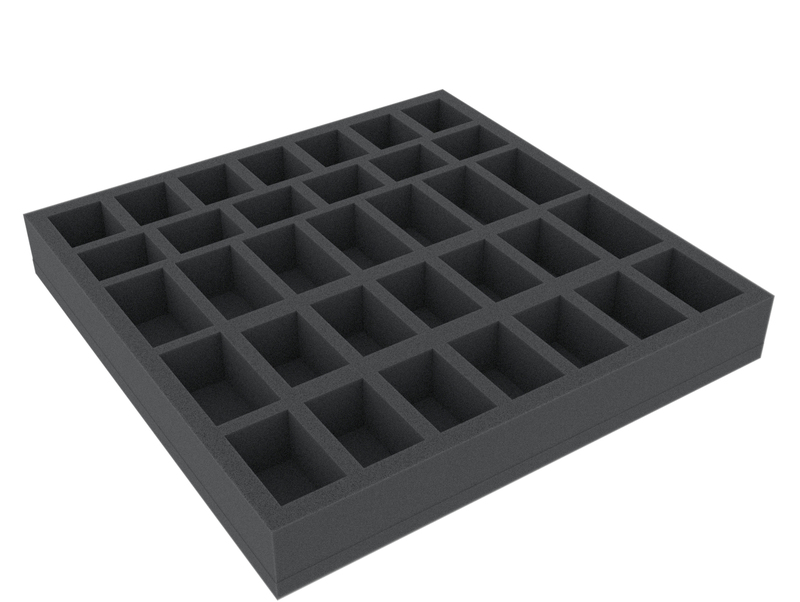 Lower tray: 285 mm x 285 mm x 55 mm total height (45 mm usable height + 10 mm foam base). 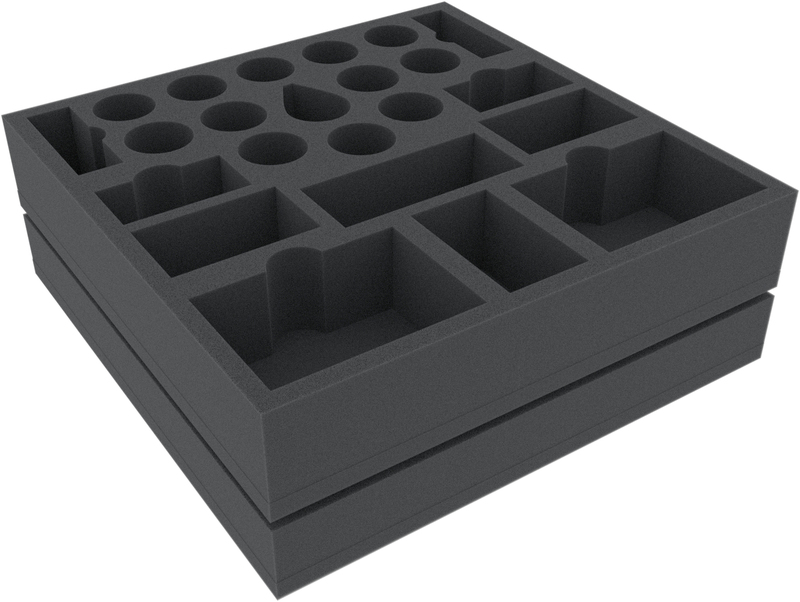 Upper tray: 285 mm x 285 mm x 40 mm total height (30 mm usable height + 10 mm foam base).